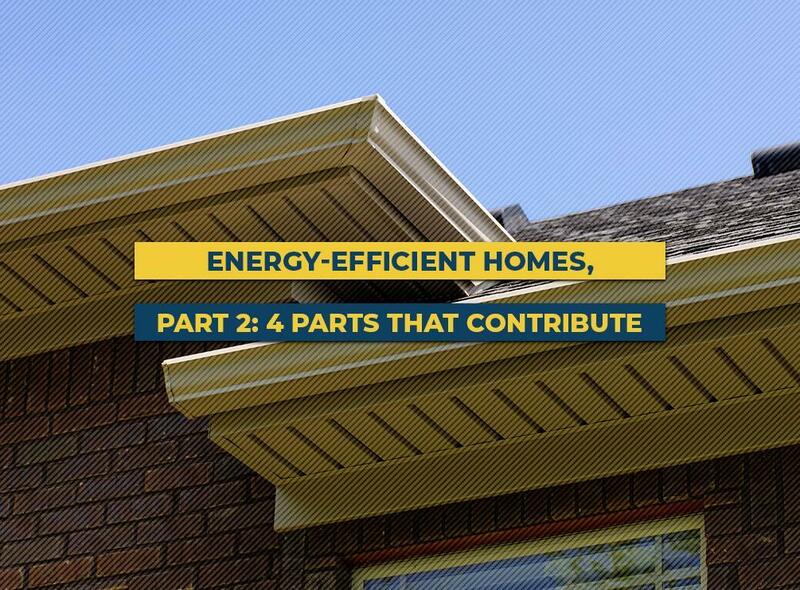 Previously, we discussed how the right roofing options can help improve your home’s energy efficiency. We now conclude with the other areas that assist your roof and gutters, and contribute to your home’s energy efficiency. Drywall – Exterior walls occupy a large area of your home, so drywall requires the right kind of insulation. While most homes are required to have insulation within the drywall, the quality of the insulation material itself can vary, and it can end up rotting over time. If you are not the first owner of your home or are unsure whether you should have drywall insulation replaced, have your home inspected by a professional energy auditor. If you end up needing new insulation, consider other insulating options like blown-in foam. Siding – Siding isn’t just for adding color and texture to the exterior. The right kind of siding material can block outside heat, for example, certain kinds of fiber cement siding. With less heat absorbed through the siding, very little heat actually makes it into your home. Plus, some siding products have low-maintenance properties that don’t allow water stains to develop in case of spills from the gutters. Windows – Replacement windows are home improvements that can truly contribute to your home’s energy efficiency. Traditional windows have single panel glass that allow heat transfer, which, as discussed in our earlier installment, can ultimately lead to higher energy consumption. Some modern replacement windows have dual glass panels. The air gap between interior and exterior surfaces minimize conduction, which, when combined with insulated window frames and proper installation procedures, can help make your home more energy efficient. Features like low emissivity coatings block harmful ultraviolet (UV) rays and heat from the sun while allowing natural light through. ENERGY STAR®-Certified Appliances and Electronics – Electronics and appliances account for up to 30% of an average home’s monthly energy consumption. Everybody uses electronics on a daily basis, from kitchen appliances to computers and entertainment systems, and even to home security, so choosing appliances with the ENERGY STAR® certification matters. The ENERGY STAR certification is your guarantee that the product consumes significantly less energy compared to its non-certified counterpart. If you would like to know more about our services, including protection for your gutters, call Garlock-French Corporation today at (612) 722-7129. Alternatively, you can fill out our contact form to schedule your free in-home estimate. We serve Minneapolis, MN, and nearby areas.